Are You Kidding Me?! : Thanksgiving - "It's a yam sham." I stopped celebrating Thanksgiving when I was fifteen. I grudgingly ate the food on the table. I gave an attitude toward the turkey—stabbing it with my fork like it was fully responsible for my anger toward this day. I had learned about real deal about Thanksgiving only a few years before—the settlers (pilgrims), the natives, all of it. And it wasn’t a Charlie Brown special, that’s for damn sure. Also, there was no “First Thanksgiving”. Well, there was a “first” but it wasn’t in the 1600s. If you traveled back in time and wished a pilgrim a Happy Thanksgiving, they’d have no idea what you were talking about. It was a harvest festival. One that was only successful due to the fact that the natives had helped the pilgrims learn how to grow and gather food. And because, when the natives arrived, they hunted deer to help feed everyone. Whatever. President Lincoln, who I’m pretty sure wasn’t at this festival, declared this autumnal harvest an official national holiday in 1863, a good two centuries after the first harvest. It’s a nice idea and all, Lincoln, but it’s just something that hit me when I was a girl and has never really gone away. I remember my mother rolling her eyes and my father scoffing, but I also remember that, every year after that, my father made up a plate and set a place for Massasoit. It made me less moody and I was grateful. I don’t remember if I let him know at the time but I was. 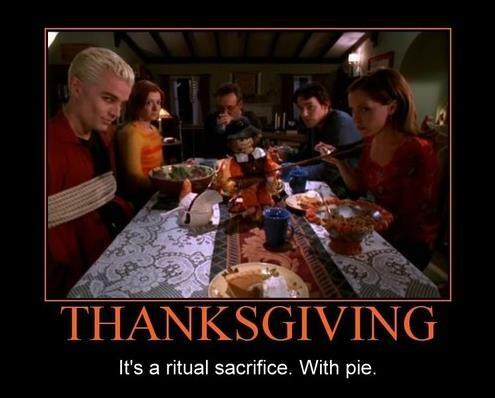 Willow: Buffy, earlier you agreed with me about Thanksgiving. It's a sham. It's all about death. Buffy: It *is* a sham. But it's a sham with yams. It's a yam sham.